This month at Jersey Cares we are celebrating Women’s History Month by inviting some of our friends to share their thoughts and experiences on the women who have inspired them. Today we feature a piece by Siara Clemente, Jersey Cares Program Coordinator, ReadyCorps AmeriCorps Member. In honor of Women’s History Month and all sheroism, I have recently reached out to a former college professor of mine, the now retired, Det. Sgt. Toni Latario. While I was completing my B.A. in Criminal Justice, I was lucky enough to have Toni as my Criminology professor. Although a 6:30pm to 9:45pm, college night class can seem rather tedious, having Toni share her real life experiences with us really inspired me, and fueled my passion of helping others that much more. This is why I want to share her story. Toni began her career in law enforcement in the early 1990s as a patrol officer for Plainfield Police Department, although she had aspirations of becoming a FBI Agent. In fact, in 1991 she passed the FBI entrance exam, right as they underwent a hiring freeze. While Toni was waiting for the hiring freeze to be over, she took the Police Officer Civil Service tests and chose Plainfield PD. Having grown up with a sense of pride in her city, she chose to serve her community as an officer. The goal was to gain experience as a patrol officer, and ultimately give the FBI reason to admire her for her tenacity to work in a rugged town. Little did she know, two years later to the day, she would be accepting a job with the Warren County Prosecutor’s Office, right before receiving a call from the FBI New York Field Office inquiring if she was still interested. It was at that moment that she made the best possible decision for her career, and opted out of the FBI. After gaining two years of patrol experience, Toni left Plainfield PD to begin her career with the Warren County Prosecutor’s Office. Toni’s first assignment was in undercover narcotics, and less than a year later she was assigned to the Special Victim’s Unit, where she remained for over 15 years. Throughout Toni’s career with Warren County, she worked in every unit, including Major Crimes, Special Victims Unit, Domestic Violence, and Juvenile and Community Policing Units. Prior to retiring, Toni was the supervising detective of the Domestic Violence, Juvenile and Community Policing Units; the Human Trafficking Liaison for Warren County; and served as the Bias Crime Officer for Warren County. Toni assigned cases to detectives and still conducted investigations on her own in addition to training and supervising office detectives and college interns. Toni also represented the Warren County Prosecutor’s Office for six years when she worked as a facilitator for the New Jersey Division of Criminal Justice, Office of the Attorney General, Advanced Investigation and Prosecution of Domestic Violence Cases. Trainings were held twice a year across New Jersey, and these trainings allowed Toni to build some of her most cherished relationships with others, especially law enforcement agencies, should she have ever needed their assistance. When asked about how it feels to now be retired, Toni explained that at first she felt like a fish out of water, but now she’s actually busier than before. Not only is she a professor at two colleges, but she is also the Vice President of an organization known as the New Jersey Women in Law Enforcement (NJWLE). However, Toni has additional plans for her retirement. She’s interested in being a security guard, or perhaps even becoming a private investigator. It’s important for people to know that Toni didn’t come from the ideal family background. When she was in high school her parents got divorced, and she actually dropped out after her school shut down when she was a junior. At that point, it made the most sense for Toni to work and help her mother support her and her two younger siblings. Toni did obtain her GED while working, but unfortunately her family lost their home and they were homeless for a while, at least until other family members gave them a helping hand. Toni does admit that there was a certain amount of shame growing up in such difficult circumstances, however, she is aware that those experiences have made her into the astounding officer that she was, as well as the inspiring woman that she is today. After all these years, Toni still carries what she’s learned at the Police Academy with her. Her training taught her to over prepare and never allow mediocrity, but only excellence. Early on in Toni’s career, random inspections would take place in their patrol cars to see if they had their extra kits which consisted of additional supplies and clothes in case of a disaster; to this day Toni is proud to say she still keeps a kit in her personal vehicle. Being an officer and training future officers has also shown Toni how aware or unaware local agencies may be of the special needs and disabled population in their communities. Toni made it a point to say that everyone should be aware of the communities they reside in and their neighbors, as communities thrive when they are closely knit. It’s also a great idea to inform first responders of any special needs or disabled people in your home; you can register all those needed through your local 911 center. Communication is key when working with your neighbors and first responders regarding emergency preparedness. Retired Det. Sgt. Toni Lattario is the epitome of a shero, and I am honored that she allowed me to share her story. May she inspire you to be the change, as she is the change she hoped to see in the world. May she remind you that your past does not determine your future. May she be an idol for those in need of a shero, or for those who hope to become a shero, as sheroes come in all shapes, sizes, and professions. To sheroes! Water you waiting for? 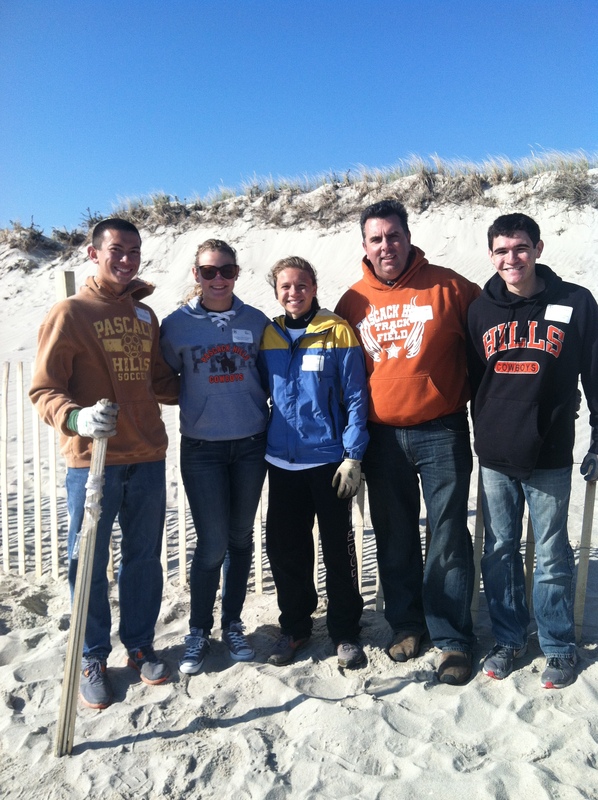 Give these volunteers a round of applause for doing an amazing job helping rebuild dunes lost from Superstorm Sandy. There is still so much to be done! Learn how you can help! 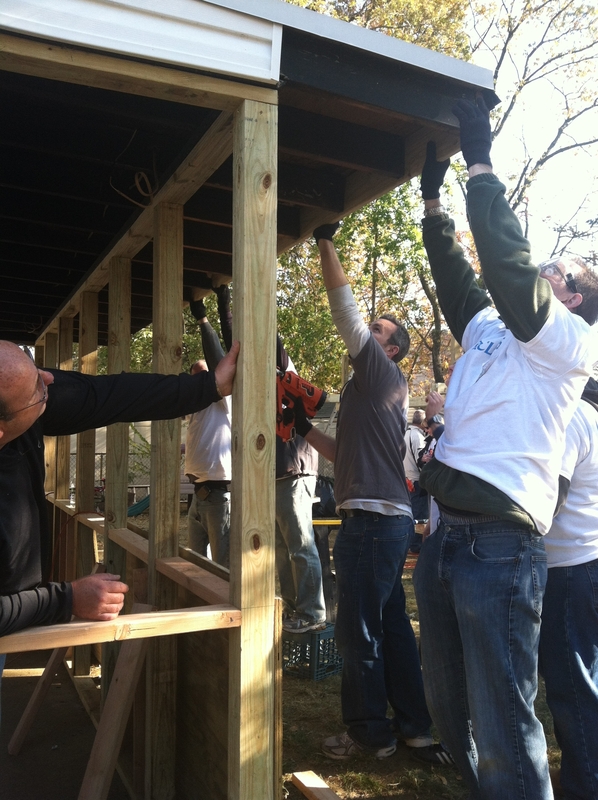 These Barclays employees are laying out the framework for a great day and porch for a New Jersey family whose home was destroyed by Superstorm Sandy. Woodn’t you like to be a part of the change? Volunteer today! 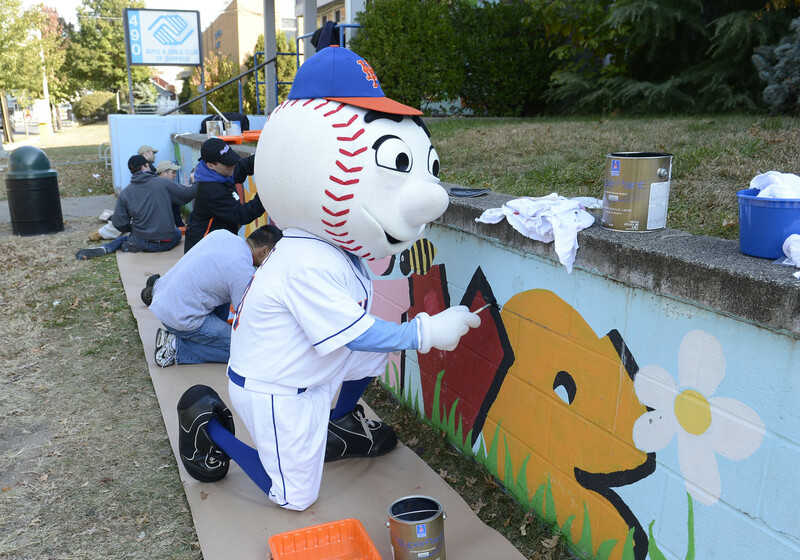 NY Mets employees and Mr. Met hit it out of the park by volunteering at an agency in Garfield, NJ that was affected by Superstorm Sandy! 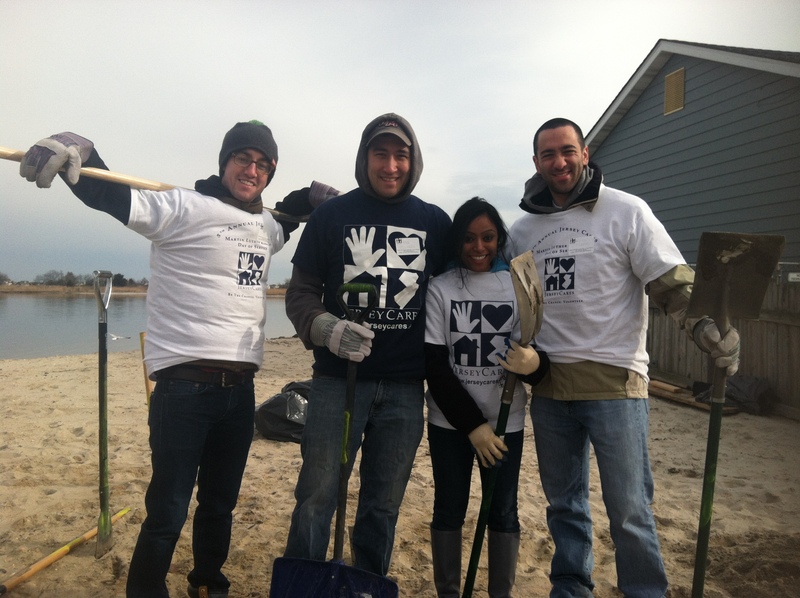 Step up to the plate and volunteer for a Sandy Recovery project today! Click here to learn how. What do you do with a sick boat? Take it to the doc! 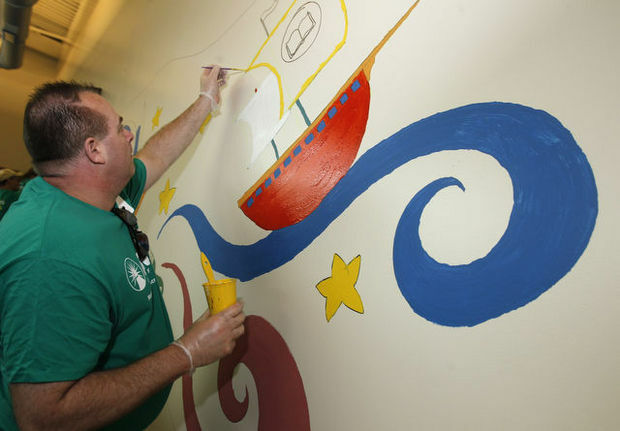 This Fidelity volunteer did an amazing job on this ship mural at a school damaged by Sandy in Union Beach, NJ.